This week we had the honour of holding an evening for Anastasia Lin, to show our support for her bravery in continuing to speak up for human rights. As Canada’s Miss World candidate, and star of our upcoming feature film The Bleeding Edge, Anastasia has fought tirelessly for a right to compete in Miss World and to share her beliefs in “tolerance, diversity and freedom”. While she was met with intimidation tactics and banned from entering China and the competition, Anastasia has not backed down, which is why we wanted to show our appreciation for her last night and support her with an opportunity to share her message. 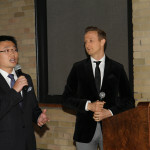 Co-hosted by Mark Media CEO Jason Loftus and Flying Cloud Productions President Leon Lee, the event featured a moving speech and piano performance by Anastasia, as well as a sneak peek of the new trailer for The Bleeding Edge, in which Lin stars as a woman arrested and tortured in China for speaking out against human rights abuses. “When Anastasia herself was blocked from the Miss World pageant because of her human rights advocacy, this really hit home and we were deeply moved,”said Loftus. “Quite a few actors that were interested in co-starring with her eventually pulled out of our film because they were too afraid. But Anastasia never wavered,” added Lee. We are incredibly grateful to the media and celebrity guests that stopped by to show their support, and hope that Anastasia’s ongoing work continues to bring awareness and inspire people to stand up for what is right. Please visit The Bleeding Edge on Facebook to view the new trailer for the film, which will be released in 2016, and for updates on Anastasia’s story. Star of The Bleeding Edge speaks with the BBC. Anastasia Lin speaks out in the NY Times. More on the star of The Bleeding Edge and her “battle with Beijing”. Canada’s Miss World contestant Anastasia Lin speaks with The Toronto Star about how her visa to travel to the beauty pageant at a Chinese resort has been delayed, and her father has been harassed by Chinese officials because she has spoken out about human rights abuses. 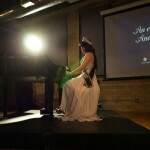 S he first became attuned to the issue after acting in a movie called “The Bleeding Edge.” Researching for her role as an imprisoned Falun Gong practitioner, she spent time at the group’s attention-grabbing displays in Toronto’s Chinatown. “Because the practitioners themselves, some of them have language barriers, cultural barriers, so when they come here they don’t really have a channel to speak to the West about their experiences,” she said. The star of The Bleeding Edge, human rights activist Anastasia Lin, was just crowned Miss World Canada but now her family is being threatened in China. Bravely she continues to fight for freedom.